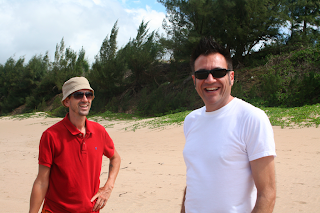 My hoaloha (great friend) Robert whom I have known since 1986 came to visit this past week from San Fransisco. We did our best to give him the whistle stop tour.... La Perouse Bay, Haleakala, Hana, Lahaina, Kihei, and garage sales in Kula. 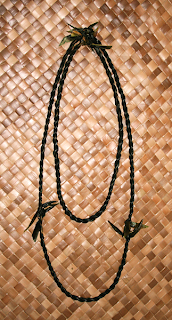 For his arrival I tried my hand at making my first ti leaf leis. 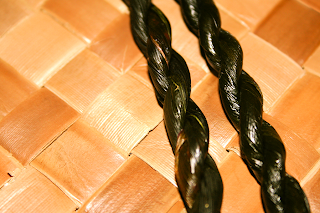 They actually came out quite beautiful... if I might say. I'll post a how-to in a later posting. 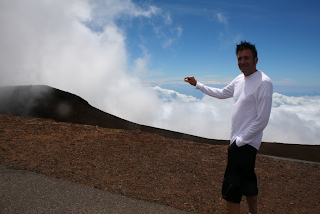 High atop Haleakala at 10,023 feet... that's the Big Island Robert's pinching. 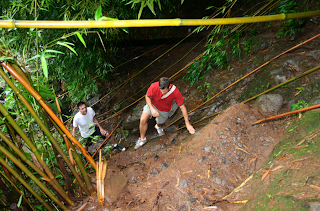 John and Robert scaling a muddy wall on a bamboo forest hike along the Road to Hana. Looks Like fun and a little dangerous! OOOhhh!